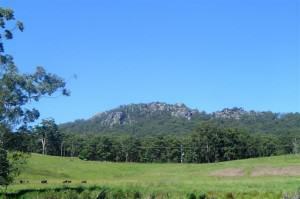 Bulahdelah, on the mid north coast of New South Wales, is known as the Gateway to the Myall Lakes. 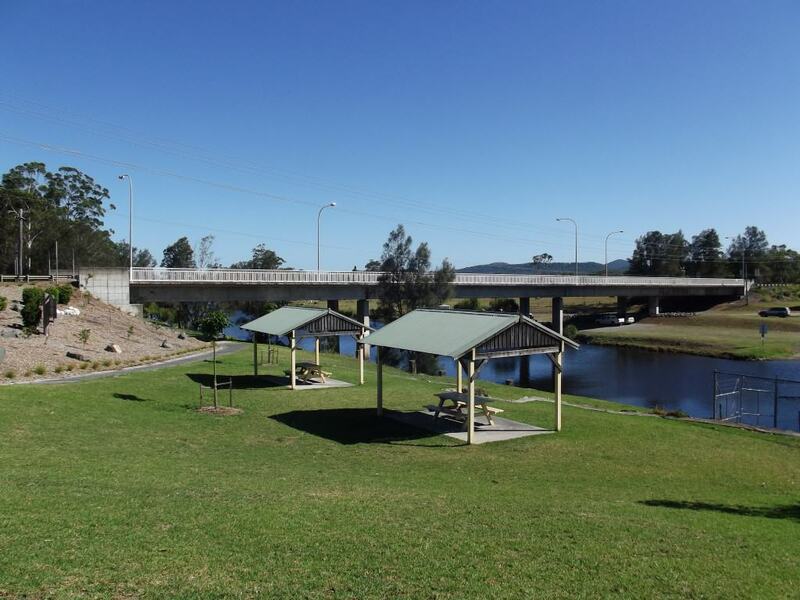 Located at the junction of the Myall River and the Crawford River, the name is derived from the Aboriginal word meaning “meeting of the waters”. We’d often been asked why we didn’t have Bulahdelah on our website and honestly couldn’t give a clear answer. Obviously, a trip to Bulahdelah was well overdue. And so, on a sunny and quite hot Friday afternoon we packed up the caravan, loaded our little dog into the car, and off we went to explore this great little town right on our doorstep. With the recent completion of the Bulahdelah bypass there was certainly no traffic to contend with and it didn’t take us long to roll into the Alum Mountain Caravan Park ([star][star][star][star]). We were more than pleased by what we found there. What a great park! We’d driven past it so many times and didn’t realise what a fantastic place it is. 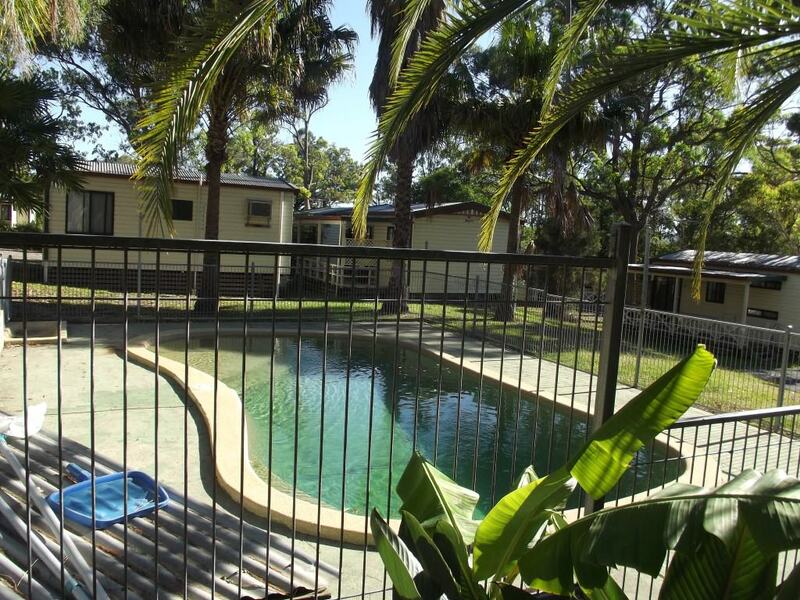 Spacious sites, great amenities, and extremely friendly people. The couple camped next to us, Mike and Carol, had been there for a week and were in no hurry to leave, they liked it that much! explore here that we were spoiled for choice. The town is bordered by the Myall Lakes National Park, the Myall River State Forest, Alum Mountain, and the Wang Wauk State Forest but with the heat that afternoon we headed for the Myall River. Riverside Park, right beside the Plough Inn Hotel, is a great place for a picnic. On the banks of the river, there are sheltered picnic tables, a walking path, and some great views of the river and Alum Mountain. Opposite the park is the Lions Park, a rest area with overnight camping permitted. There were quite a few vans and motorhomes already setting up for the night. What we didn’t realise at the time was that this was the weekend of the famous Bulahdelah Bass Bash, a catch-and-release competition run by the Bulahdelah Fishing Club. We wandered around the park and chatted to a few of the locals for a while and then decided it was time to head back to camp to get ready for dinner. But first we had our bottle of Two Tails Sparkling Wine waiting for us to toast another new adventure. 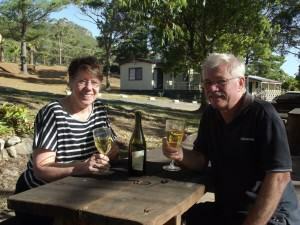 We settled in beside the pool, in the barbecue area, and raised our glasses to Bulahdelah and the Alum Mountain Caravan Park. Then it was time to get ready for dinner. There are a large number of places to eat in Bulahdelah but a pretty fair proportion of them close their doors long before the dinner crowd makes an appearance – and by this I mean even the early dinner crowd. And so our choices were fairly limited. So we decided on dinner at the bistro at the pub and we set off for the Plough Inn Hotel. Well, we thoroughly enjoyed our dinner there that night. Of a higher standard than your basic pub fare, the food was delicious and we’ll certainly be making a return visit to this one. Our only disappointment was in our own decision to sit inside instead of outside overlooking the river. By the time we made our way back to camp we were more than ready for sleep. John took BJ to do what all little dogs have to do before bed and I think I was asleep before they even got back. to the area. Overlooking the town is Alum Mountain and from the lookout there are some spectacular views of the whole area from Cabbage Tree Mountain, west of town, to the coastline. The mineral alunite was discovered here in the 1870’s and the mountain was mined until 1927. 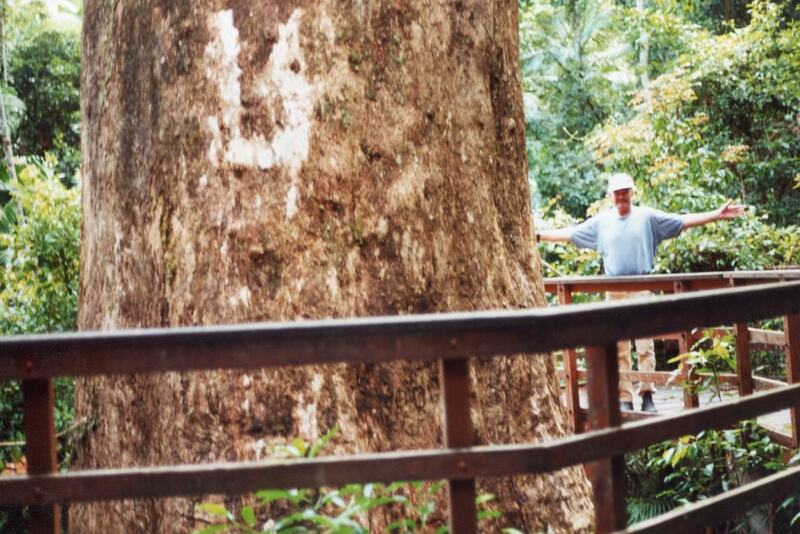 The whole Bulahdelah area also has a strong logging history and that continued up until 1994 when political pressure from conservation groups resulted in much of the land becoming national parks or state forests. 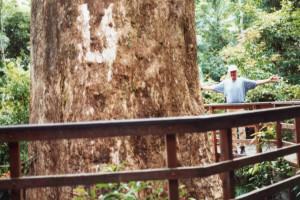 the Myall Lakes National Park, it is estimated that this magnificent flooded gum is over 400 years old. The tree itself is 84.3 metres (277 feet) high and is 2.7 metres (9 feet) in diameter at breast height. Magnificent doesn’t really describe this behemoth or the plant world. I felt sure I was going to end up with a stiff neck trying to take a photo up to the top of it! We stood on the platform and gazed in awe at the sheer size of it. The platform and fence protect The Grandis so you can’t get too close to it and that’s a good thing; it’s a sad fact that without the fence to protect it chances are it would end up covered in graffiti or worse. 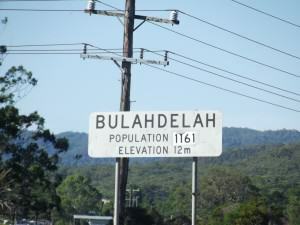 Way as it is now known, and travel the “dreaded” Bulahdelah Mountain. It was in 1999 that the Mountain was bypassed in the Bulahdelah to Coolongolook highway upgrade but before that the mountain road was the only way to travel north from Sydney along the coast. The road twists and turns, it is narrow and steep in parts, and in one area notorious for accidents there are concrete blocks down the centre of the road. Of course, today driving along the Old Pacific Highway is a breeze, we didn’t pass or see another vehicle the whole way, and the landscape is stunning! Such a beautiful rain-forest type feel to the whole place. We stopped for lunch at The Salty Dog Seafood Café in the little town of Coolongolook, 30 kilometres (18 miles) north of Bulahdelah before making our way back via the Lakes Way from Forster, a little further on. We stopped briefly at Smiths Lake, about 40 kilometres (25 miles) north of Bulahdelah before turning off on the road to Seal Rocks. We’ve been to Seal Rocks many times over the years and it’s a place we never get tired of visiting. John was grumbling because he hadn’t put the fishing rods in but I was more interested in a visit to the Seal Rocks Lighthouse. 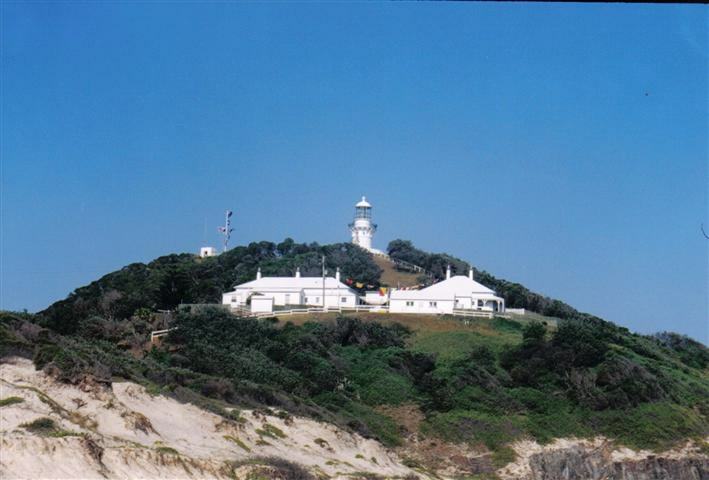 This lighthouse is one of only two in Australia with an external stairway and guards a treacherous rock formation nearby. Established in 1875, it is built on a point of land known as Sugarloaf Point. In 1879 one of Australia’s most tragic shipping disasters occurred off this lighthouse when the vessel Catterthun sank with the loss of 55 lives. The light is operated by the Australian Maritime Safety Authority and became completely automated in 1987. We left the lighthouse and wandered down to the beach for a stroll along the sand. Even though the sun had started its downward journey it was still hot on the beach. The light breeze wasn’t much help. It was time to start heading back to camp. according to him, was great and he was a tad reluctant to get out but he did want to spend some time at the river before we had to leave and I wanted to visit the Great Lakes Winery. Down at the river the Bass Bash was in full swing with boats leaving and coming almost continuously. John settled in for a while and chatted to a few other spectators. The competition is open to everyone, young or old. But there’s only so long I can sit staring at people fishing no matter how good the day is and so I wandered off to the old Bulahdelah Courthouse. and back in the colonial days they were considered the most comfortable cells of any courthouse in the world! Inside, the history of the pioneers was really interesting and especially how the old timber bridge across the river was built and the story of the Bulahdelah Tornado. The most destructive tornado ever documented in Australia swept through the Bulahdelah State Forest on New Years Day 1970 and left a damage path 22 kilometres (14 miles) long and 1.6 kilometres (1 mile) wide. I was totally absorbed in the history when John arrived to remind me that we wanted to visit the winery and so I reluctantly left the courthouse and the history behind but made a mental note to pay another visit soon. 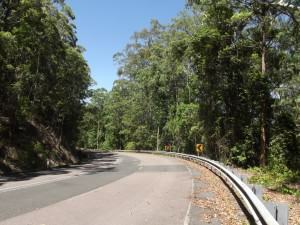 Once more we drove the old Pacific Highway to Wootton on our way to the winery and again we didn’t see another car. However we did see a few motorbikes and these guys must think this is Eastern Creek! It was a case of just getting out of the way and doing it smartly! I was really looking forward to a visit to the winery and so you can imagine how disappointed I was when we arrived to find the place closed. The winery is 2 kilometres (a little over a mile) from the main road, along an unsealed road. The sign at the turn-off said “Winery Closed” but we thought we’d drive down anyway just on the off-chance that someone had forgotten to take the sign down. But no such luck, it was indeed closed. Disappointed, unimpressed, but what can you do. And so, it was time to head for home. It had been a great couple of days and we certainly learned a bit more about this interesting little town. 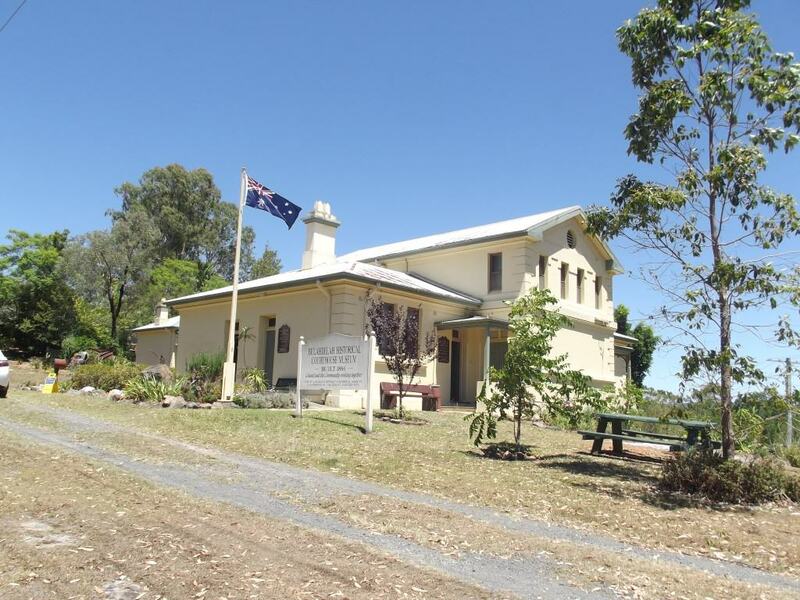 There’s a lot more to see and do in Bulahdelah and we certainly hope to be able to explore it some more in the not-too-distant future. And John wants to fish in the river.